The US Army psychiatrist who shot dead 13 people at a Texas Army base has declined to make a statement as jurors begin considering his sentence. 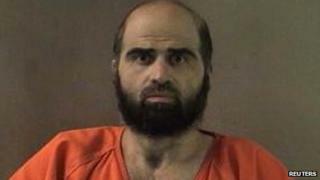 Maj Nidal Hasan, 42, faces the death penalty after being found guilty of the attack at Fort Hood Army base in 2009. He is defending himself but has stayed largely silent throughout his trial. During the sentencing phase on Tuesday, he rested his case without offering any witnesses or providing evidence in favour of a life sentence. The former military psychiatrist had previously tried to admit multiple murder charges, but military rules ban guilty pleas in death penalty cases. Maj Hasan was convicted of 13 counts of pre-meditated murder and 32 counts of attempted murder on Friday. He said he opened fire on unarmed US soldiers, killing 13 and wounding many more, to protect Taliban insurgents in Afghanistan. The military jury, which reached a unanimous verdict in seven hours, began the penalty phase of the trial on Monday. For the 13-member panel to recommend that the judge sentence Maj Hasan to death, it must come to a unanimous agreement. If the panel members do not agree, he will face a life sentence in prison. Among the last barriers to military execution is authorisation from the president. Maj Hasan, a Virginia-born Muslim, rested his case shortly after family members of those killed, along with soldiers wounded in the rampage, gave emotional testimonies about their lives since the attack on 5 November 2009. His court-appointed legal advisers tried to step in on his behalf. But military judge Col Tara Osborn denied their request, saying Maj Hasan had the constitutional right to represent himself. "It is my free and voluntary decision," he told her. Closing arguments are scheduled for Wednesday, but it is unclear whether jurors will hear from Maj Hasan again, the Associated Press reports. His court-appointed lawyers previously told the judge they believed he sought execution in a bid for martyrdom. Prosecutors said he had prepared carefully for the attack for weeks and fired a total of 146 bullets. The shooting spree ended when he was shot by a civilian police officer. He was paralysed from the waist down from the wound and now uses a wheelchair.